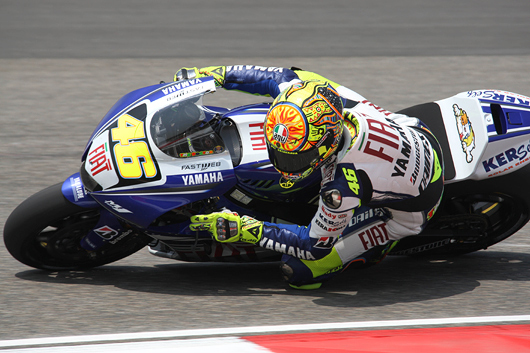 Six-time MotoGP World Champion Valentino Rossi starts the 2008 season with Yamaha in an unusual position, following what was undoubtedly one of the hardest seasons of his career. Rossi took four race wins in 2007 and several podiums, but his prodigious talents were limited by technical and tyre problems as well as plain bad luck. The Italian missed out on the runner-up spot in the championship by just one point after his final race was wrecked by injury and third place was his lowest championship finish since his rookie year in 1996. 2008 will see Rossi hungry to win back the title he previously made his own for five years as he sets out on a new chapter in his career, having made the switch to Bridgestone tyres. In 2000 he entered a new phase of his career when he joined forces with Honda in the 500cc class. He proved his worth once again by finishing second, before becoming the last ever 500cc World Champion in 2001. Rossi subsequently took the MotoGP World title in 2002 and 2003, before moving to Yamaha and winning it again in 2004 and 2005. Rossi made history by moving to Yamaha in 2004 and winning the season-opening Grand Prix in South Africa, becoming the first rider in the history of the sport to win back-to-back premier class races for different manufacturers. He went on to win nine out of 16 races, finally clinching the World Championship title, Yamaha`s first for 12 years, with victory at the penultimate Grand Prix in Phillip Island. A final win at the Valencia Grand Prix also ensured that the Yamaha Factory Team won the team title. 2006 saw him finish World Champion runner-up for only the second time in his premierclass career, having lost the title to Honda’s Nicky Hayden by just five points following a final-race showdown in Valencia. Despite this, Rossi still took five race wins and five pole positions in 2006, more than any other rider, and stood on the podium ten times. 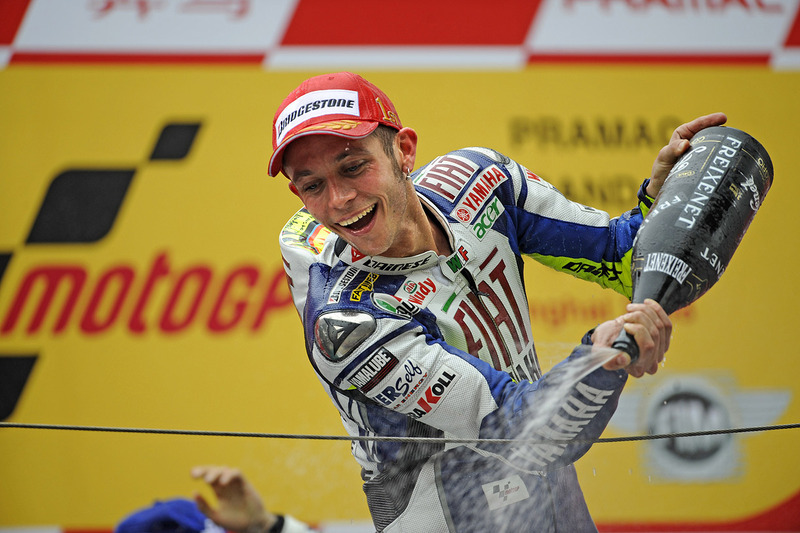 He turns 29 in February 2008 and remains the youngest rider to have won World Championships in all three classes. He continues to have the support of his long-standing Crew Chief, Jeremy Burgess, who moved from Honda to work with him at Yamaha Factory Racing in 2004. One of the most popular members of the paddock, ‘The Doctor` has a wide fan base all over the world. A keen football fan and an accomplished rally driver, He is based in London between races. 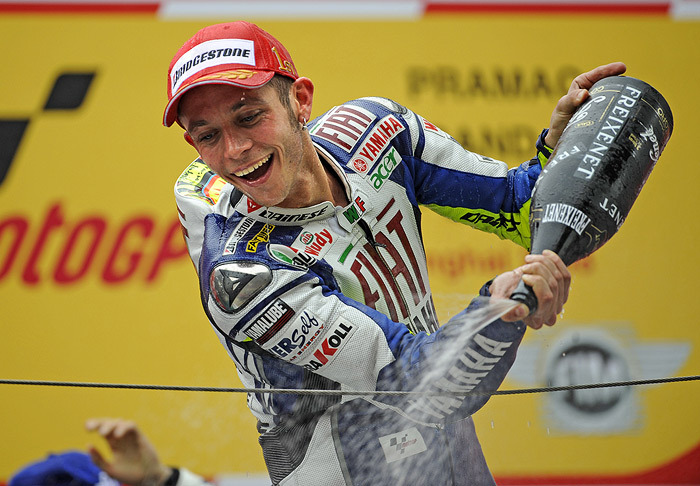 Valentino Rossi winning the 2008 MotoGP World Championship. Motegi, Japan 28/09/2008 - “I think it’s difficult to say, but maybe this is even better than the first championship with Yamaha in 2004. In 2004 I arrived after three championships in a row; the change was very big and no one expected me to win then, not even us to be honest! But this year is great too because I didn’t start as the number one favourite after losing for two years. The taste of this is something special. “In 2006 I lost because of bad luck; I still won the most races and was the fastest on track for most of the time, but in 2007 Stoner was a lot faster than us and so we got to the end with a big of disadvantage. Winning this championship was very difficult but also very, very important. “The decision to change to Bridgestone tyres, which I took together with Jeremy, my team and all the Yamaha crew, was very important, as were the changes to the bike because the first 800cc M1 last year was not competitive enough. We spoke a lot during last season and I remember a strange meeting in Valencia last year, me with a broken hand, speaking with Furusawa about 2008. From then we started to work on the improvements for this season. It’s also been important to have the right people in the right place and this year everything has been correct. It’s been step-by-step. “I think I have made a lot of good decisions this year and we have been competitive from the start. Qatar was the worst race of the season but I knew our potential was good so, although we were a bit worried at that point, we weren’t desperate because we knew if we fixed a few problems we could try to win. 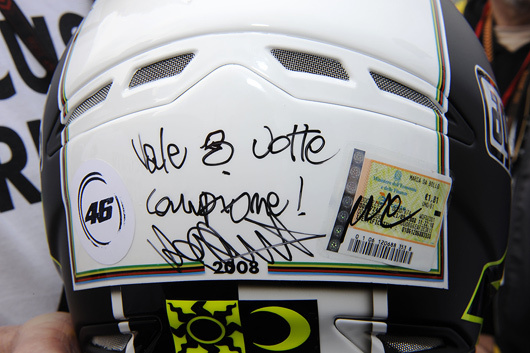 Always the showman, Valentino brought his own Notary Public from Italy to Motegi to certify on his helment, after the race, that Valentino had won his 8th World Title. “I grew up a lot in the last two years, because at the end of 2005 I had a great career and I had won all the important targets so far. 125, 250 and then five titles in a row in MotoGP with two different bikes – I felt unbeatable. But in 2006 and 2007 I learnt to lose and this has been very important. I came out much stronger and my level of concentration and effort to win this championship has been higher than ever before. “This season has had some different periods. At the beginning of the year we had some important results when Bridgestone wasn’t the strongest: Jerez, Portugal and others, and in that period we took a big advantage from Stoner. After Barcelona Casey started to ride like a demon and dominated three races in a row, and then we went to Laguna which was the turning point of the season. Laguna was a real battle and from then on we have flown. “I am very content at Yamaha and this is why I signed for two more years. I had some good offers at other factories, but I already changed bike once and proved everything I wanted to and so there is no need to do that again. Also I am no longer 20 years old and I need a good atmosphere in my team in order to keep me focused and happy, and I have this at Yamaha. The atmosphere in our team, from the Japanese all the way down to the garage is fantastic and this is what makes me want to stay. “I think 2009 will be even more difficult than this year. Now I am the world champion again and I have demonstrated that I am still very fast; I think I rode the best of my career this year apart from the mistake in Assen, but next year is another story, it depends on how the winter is and how Stoner, Pedrosa and also Lorenzo are next year, as well as the other riders because there are many fast people in this championship. I think it will be a great championship and I’m looking forward to it, but first I want to finish this year and try to win the final three races! “As I said, there are many strong riders but of course I hope that in the future nobody will win like Valentino Rossi! Maybe my brother Luca will be as strong as me…I wanted to take him on my bike on the celebration lap, but they did not allow it. Maybe I will wait for him to be a MotoGP rider before quitting, then I will beat him in the first year, and then I will stop riding! “When you are 20 or 22 yrs old, you live everything in a different way. It’s different… In 2000, maybe, I could have won on my debut, but I underestimated myself! In 2001 it was the last chance for me to win in 500, so I gave it my best and did that. In 2001 it was the year of the battle with Biaggi, in 2002 it was the year when everybody said that I won because of my bike, then 2003 was the year of Gibernau, it was hard until the end. They were fantastic years but with Yamaha it is different. I enjoy it more. “During 2003 I started thinking about Yamaha. Of course I was scared about the new challenge, it was a big question mark. This year, when I tested the new bike and the new tyres, I understood that I could win. In 2004, however, when I tested the new bike I understood we had to work a lot. Sincerely, the feeling of winning in Welkom in 2004 was the strongest emotion of my career; more so than in Laguna Seca this year. The 2005 the M1 was very fast and that one and the 2008 one are the best Yamaha bikes ever. 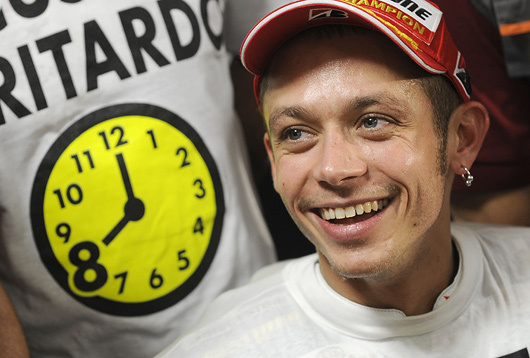 An Officially Certified World Record: Valentino Rossi 8-Times World Champion. • Rossi has joined Giacomo Agostini as one of only two riders to have taken six or more premier-class World Championships. • Rossi is only the second rider to regain the premier-class title after a two year gap – the other rider to do this was also Agostini. 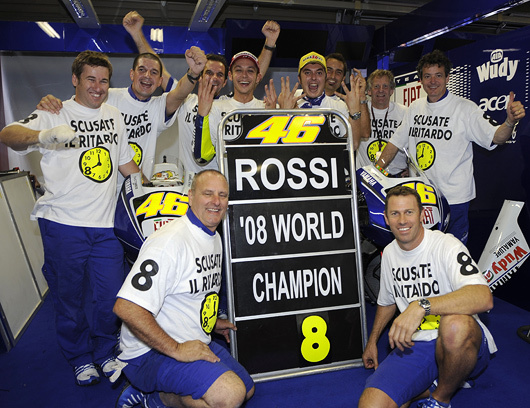 • This is Rossi’s eighth world title across all classes. Only Agostini with 15, Angel Nieto, with 13, Mike Hailwood and Carlos Ubbiali, with nine each, have won more. • Rossi is the first rider to win the premier-class title on four different types of motorcycle: 500cc 4-cylinder two-stroke, 990cc 5-cylinder four-stroke, Yamaha 990cc 4-cylinder four-stroke and a Yamaha 800cc 4-cylinder four-stroke. • It is eleven years since Rossi’s first World Championship success in the 125cc class in 1997. The only rider with a longer period between his first and last titles is Angel Nieto, who won the 50cc crown in 1969 and the 125cc equivalent in 1984. • With his 69th career MotoGP win at Indianapolis, Rossi broke Giacomo Agostini’s record for the most premier-class victories; a record that has stood since the legendary Italian’s final victory at the West German Grand Prix in 1976. • Rossi is also Yamaha’s most successful rider, having scored 13 more premier-class wins for the factory than Kenny Roberts. • With three races to go he is the only rider to have scored points in every round of the 2008 season. • Rossi’s sequence of five straight race wins since Laguna Seca is his longest run of wins since 2005, when he also scored five successive victories. Other facts about Rossi’s career. • In 1997 Rossi became the second youngest ever 125cc World Champion after scoring 321 points and eleven wins. • Two years later, he became the youngest ever 250cc World Champion with nine wins. • In 2001 Rossi joined Phil Read as one of only two riders ever to win the 125cc, 250cc and 500cc titles. • Rossi’s debut victory for Yamaha at the opening race of 2004 in South Africa made him the first rider in history to take back-to-back wins for different manufacturers. • After winning the MotoGP World Championship three times with Honda, Rossi took his fourth premier-class title with Yamaha in 2004 and became the only rider other than Eddie Lawson to win consecutive premier-class titles for different manufacturers. Nov 2008 - 2008 MotoGP World Champion explains how disappointment and changes spurred him on to regain title. From the disappointment of 2006 and 2007, Valentino Rossi came back strong in 2008. The MotoGP World Champion with a record-breaking points total, the Fiat Yamaha rider used the bad experiences of his dry two years to his own advantage this past season, as he himself acknowledges. `I think that in those two years I learnt to lose, which is an important thing because everybody loses sometimes. The style and the character that you show when you lose is so important for when trying to win another time,´ says the Italian on reflection of his most recent MotoGP campaign. `There are a lot of different keys to my success in 2008. For sure the physical and mental preparation was very important, because I tried to fix one-by-one all the problems around me to arrive at the first race very concentrated on the target,´ adds Rossi, who had attempted to address one of said problems with a switch in tyre manufacturers before the season´s start. I´m very happy with my work together with the team when Bridgestone had some problems, especially at the beginning of the year. I had a lot of pressure on me, because Michelin did a great job at the start and everybody said that I had made a mistake in changing tyres. `The Doctor´ is also much more at home with his bike, despite having to make the radical changes to suit his new rubber. A step up in quality from Yamaha was a welcome move for the now six-time MotoGP World Champion, and appears high up on his list of explanations for personal improvement. `Last year our bike was very slow, it wasn´t just the tyres. I felt a great improvement and a great effort from Yamaha to improve the M1. I felt in my skin that in every test the Japanese worked very strong so I tried to do even better,´ he explains. As Yamaha continue work on the bike for 2009, Rossi´s rival will also be pushing hard. All of the top five gave the MotoGP king a hard time in various races this past season, and he expects nothing less of them in the coming year.